Recently, in honor of Martin Luther King Jr. Day, the civil rights movement, which King led, and the struggle for Palestinian statehood, have been analogized and morally linked in ways that might have surprised King himself. These tortured analogies reject everything King represented. After all, he preached peaceful and "passive nonviolent resistance," a strategy that most Palestinian leaders have never embraced. Too many Palestinian leaders are dedicated to eradicating Israel, not living beside it. Despite widespread slanders of ethnic cleansing, there is no genocide against the Palestinians. Their people, in fact, have doubled in population since 1967. Nor are Israel's practices, as Michelle Alexander assesses in the New York Times, "reminiscent of apartheid in South Africa and Jim Crow segregation in the United States," surely not when Arabs serve on the Israeli Supreme Court and can live, work and eat anywhere they choose, vote freely in elections and are represented in parliament. The only nation in the Middle East where civil rights exist for racial minorities, homosexuals and women is Israel. It is to Israel where Ethiopian Jews were airlifted from Sudan, and where an Israeli-born Ethiopian woman was in 2013 crowned Miss Israel. 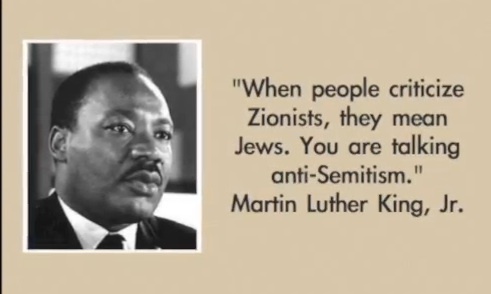 It's also in Israel where a forest is named for Martin Luther King. “The BBC is bound by its charter to ‘champion freedom of expression,'” the letter continued. “It should act on its principles and press for Eurovision to be relocated to a country where crimes against that freedom are not being committed. Four years ago this week, the federal prosecutor was putting the finishing touches on a report that would accuse then-President Cristina Fernández de Kirchner and a dozen others of helping cover up the Islamic Republic of Iran's responsibility for the attack. On Jan. 18, the day before he was to present that report to Argentina's Congress, Nisman was found dead in the bathroom of his locked 13th-floor apartment. A .22-caliber bullet had been fired at close-range into his head. Democratic National Committee chair Tom Perez said that he withdrew his organization's support from the Women's March over "a host of concerns" during an interview on Fox News' "Special Report." Perez's comment came after host Bret Baier pressed him on the DNC's originally vague reasons for withdrawing support. "Was it because of concerns of anti-Semitism?" Baier asked, in reference to controversy over the ties of the group's co-chairs to Nation of Islam leader Louis Farrakhan and allegations of anti-Semitism. "We had a host of concerns," Perez said, "and we wanted to make sure that we were clear in our values." He then outlined the DNC's platform on a two-state solution for the Israeli-Palestinian conflict. Baier also brought up former DNC chair Debbie Wasserman Schultz's recent op-ed in USA Today where she said that she could not participate in the Women's March because of "the national march’s leaders and principles, which refuse to completely repudiate anti-Semitism and all forms of bigotry." "I cannot walk shoulder to shoulder with leaders who lock arms with outspoken peddlers of hate," Wasserman Schultz wrote. Baier also asked Perez if he was concerned about anti-Semitism in the Democratic Party, especially in light of Rep. Rashida Tliab's (D., Mich.) ties to anti-Semitic leaders. - Has your company made an official statement about the Control of Economic Activity (Occupied Territories) Bill now before the Irish parliament? - Should the bill become law what actions will your company take? - If an official statement has not been made, why not? A Jewish man was 'brutally' beaten last night by three unidentified assailants Brooklyn, New York. Early in January, a Jewish man was attacked by a group of 'teenage black males' in the Crown Heights area of New York. Prosecutor Evangelos Zarkantzias instructed police Monday to treat the attack on a monument marking a former Jewish cemetery as a breach of Greece's laws against racism, which carry harsher penalties than ordinary vandalism. Thessaloniki's large Jewish community was almost entirely wiped out by Nazi forces. Until the Wedding, known in Israel as Ad Hahatunah, ran for two seasons on Reshet beginning in 2008. ABC described the show as "the story of how one couple’s decision to get married can affect everyone in their lives."